A super day today, warm, windy, and dry. We got on with the job, and drank our tea at Toddington so fast, that Stevie arrived too late - with a screech of the brakes in his JCB - and all the tea was drunk, and we were just off. Damned! We'll just have to get to work then. Last week we laid 7 panels of 45ft rail on the Malvern side siding, and got about half way to the turnout by the signal. Here's where we started today, with Steve in the background moving the site safe further south, as it will soon be in the way. With both Steve on the JCB, and Alan on the Telehandler bringing sleepers, we soon laid out the first length. Here is Ivor, a veteran of the railway who joined right at the beginning in 1981, directing two men on bars to bring the sleepers into line to lay in the rail. Ivor used to drive Antar tank transporters, among his many qualities. Shortly afterwards, with the sleepers now nice and straight, the first rail is lifted in. We're still on the shorter 45ft rails here. It's just a siding, was the cry we often heard. Hence second choice sleepers, and shorter lengths of rail. All fine for this purpose. After the length has been laid in, it gets a prod in the direction of the previous panel. It needs to be a few mm short, to leave a gap for expansion by the fishplate. This gap happens to be the same thickness as an SHC clip, so Pete here is holding it between finger and thumb while the rail is pushed to a stop. Then the second rail is lifted in, again with a group of men of a more 'solid' stature pushing the end down, to make the other end more manoeuverable with bars. Me, fat? As Obelix said in one of the Asterix books: 'There's nobody around here who's fat except me, and I'm not fat'. A group has spun off now to clip up the first length. Jim here, with only 1 arm for most of his life, is hammering the clips in with his single, good arm. An amazing performance. Way to go, Jim ! On the trolley is our supply of bits, supervised by a beaming Pete. Need a plastic pad (or 'biscuit')? A bearer? 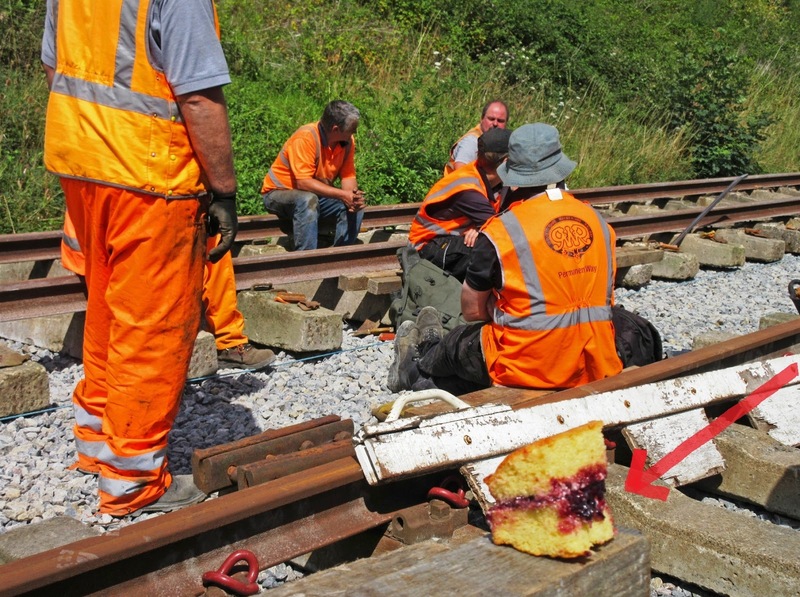 A rail bearing pad? A steel clip? We can help you here. The shop is open for business, and slowly follows the rail head along. In between deliveries of sleepers by the Telehandler, Steve comes along with a pair of rails, and another 4 sleepers at the same time, loaded on the front. The discussion is a good moment to get an overview of where we are at the moment, taken from the top of the signal with the route indicator. It's at the foot of this that the track in the foreground branches off, and it's where we want to lay to, to finish the siding we're putting in. Now one of the longer 60ft rails goes in, lifted across on to a fulcrum, from which it is located to its ultimate position in a second lift. Our work is severely judged by a supervisory committee of veteran PWay workers. What do you think of it so far, guys? We'll, we wouldn't start from here you know. Our lunch break was taken under a beautiful sky, with rails for chairs and sleepers for tables. It is rounded off by a slice of Mrs. B's excllent sponge cake, just dripping with raspberry filling. Can't you just taste it? During an errand into the station complex we took this picture from the P1 railhead, showing a pile of sleepers ready to be brought in, and work going on in the background on the siding, at something over the half way stage from the back here. Some while later, and seen from the other end, the work looks a lot closer to the P1 railhead here. Tony and Steve are clipping up, while the next stretch is ready to receive its two rails. This is the moment the Broadway gang open up a second front with another fire (cough-cough) and we hope the smoke will drift over the top of us (it didn't though). Mid afternoon we had laid 5 panels (as against 7 previously) and while two of them were longer 60 footers, the real reason we stopped here is that we ran out of (second choice) sleepers. Well, we did have some sleepers, but they were good ones, and we want to keep those for main line quality track. We have about another 60 sleepers to go to the signal, and will organise these for next time. There'll be some sleeper loading on Monday. With track laying completed a bit early today, we took the opportunity of Steve's presence to give an extra tweak to the P1 turnout were were laying. The far end was a tad off, and Ivor is putting it right here. Whoa there, Steve, that's just right. Here's our overview for the day. Depending on where you stand, we've still got a bit to do, or else we are just about there. Let's say that the siding next to the main line head shunt is looking pretty good, and also long. It's made up out of 12 panels so far (mostly 45 footers, mind you). Just two or three panels to go to the second turnout. ... you can see the Malvern side siding advancing towards the station, seen here from the canopy and right through the footbridge. It looks brilliant; we even got compliments from today's Broadway gang. Thank you, gentlemen! You are very kind. Even got a cup of tea from them. Looking the other way, we can see the replica GWR style chimney stack slowly getting taller. It's due another course of bricks, then a stone slab on top, and then finished off with a plain chimney pot. We know exactly what it should look like, and are sourcing the necessary materials to achieve the replica. The canopy over the front door is not a replica, but will include GWR style elements, such as the dagger boards, Ogee guttering and a moulding underneath, in the same style as the canopy ends. It will have a flat roof, finished off with a genuine lead sheet. That should last. Finally, a picture to satisfy our diesel friends. As we came to do some house keeping at Hayles, we noticed several on the bridge waiting for this class 25 to pass. Now that the spot has its heritage halt, it has become quite popular with photographers, as there is an interesting background to the passing train. The number? Erm, D 5185. That's not one of ours, is it? We could see the bonfire smoke from the grounds of Broadway Tower. Loco smoke next year! 5185 is visiting from the GCR, I read on the diesel blog. Maybe the Broadway gang are into Country & Western and they were sending smoke signals tot the Indians!!! Well done on the track laying today. What a difference a bit of dry weather can make. Let's hope it stays good! The station chimneys are looking great. I will have to wait until late Wednesday to see how they did with the platform gap. Regards, Paul. Just wondering if you will need trap points on the siding or scotch blocks or similar to stop stock rolling onto the running lines should the wind blow or worse? Yes!.Hayles Abbey Halt,is popular,with photographers!.There were a few there,today!.Mind though!.35006,P&O,passing through,attracted them!.Its nice to have a little update,on what's being done,on Broadway station,on a Saturday!. Anthony. That grass at the Halte looks so neat, it's like the stuff modellers use! The Raspberry filling was actually "Homemade Blackberry Jam"